← Welcome to Team Baldwin! On Friday, October 4, our school participated in the Day of Play, inspired by the Caine’s Arcade and the Cardboard Challenge. This was our second year to participate, and the kids absolutely love it. From one video in particular – Andrew’s Rube Goldberg Simple Machine – my kids heard some simple machines vocabulary. Some of the students had been exposed to this language before, and some had not. They started asking some really good questions about levers and inclined planes. I asked them if they thought it might be helpful to learn about simple machines before we started planning our own RGM. They agreed and starting researching different types. They broke into small groups, each taking a different component, and even built prototypes to share with the class. 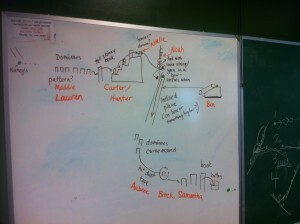 After we shared our discoveries, I asked the kids to start designing a plan for our RGM. As is typical for my class right now, there were a lot of leaders, and not enough “listeners.” When it came time to actually have a plan, there were a lot of great ideas, but no plan. I agreed to act as facilitator, since we were limited by time- being ready for Friday’s Day of Play. 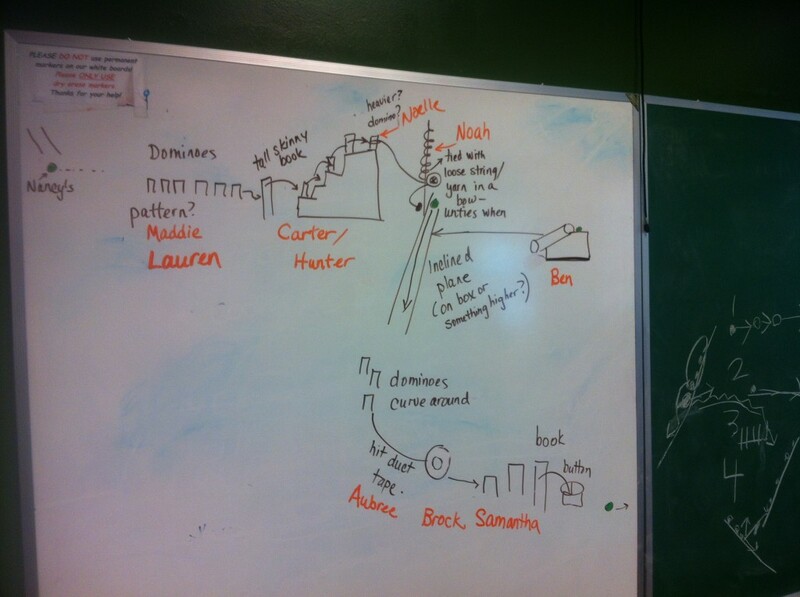 On Friday morning, we jumped into a learning lab room and used a whiteboard to sketch out our major plan. We had decided that 5 components in our machine would be a good limit, since we only had a few hours to build and test the machine. Additionally, we knew that we would connect ours to Miss Nancy’s class machine, and that her class had already planned for a ball to roll down an inclined plane to then initiate OUR machine. Some of my students were upset. I asked them if they thought they could fix the components that failed if we would have had more time. They all agreed that they could easily fix those pieces. What a lesson that was in that short conversation! On Monday, they’ll write some reflections about what they learned last Friday, their favorite part of the activity, and how they feel they could improve the next time. We’ll probably write a class song about the machine we built. My kids think differently about their learning when they put it into verse, especially with a kickin’ beat in the background. I was so proud of these kids for their hard work, perseverance, and attention to details! 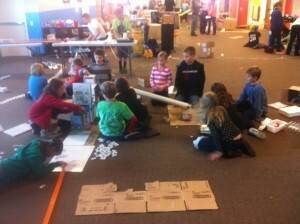 This was a very difficult task, and they rocked their Rube Goldberg Machine!